Winogrand’s quirky perspective is highlighted in this photograph of a diner or café, likely taken in Boston around 1965. The image has the effect of sloping downward on the right side. The firm, boxy heel of the woman on the far left anchors the image, preventing it from further see-sawing to the right. This photograph also highlights two types of relationship Winogrand shared with his subjects. 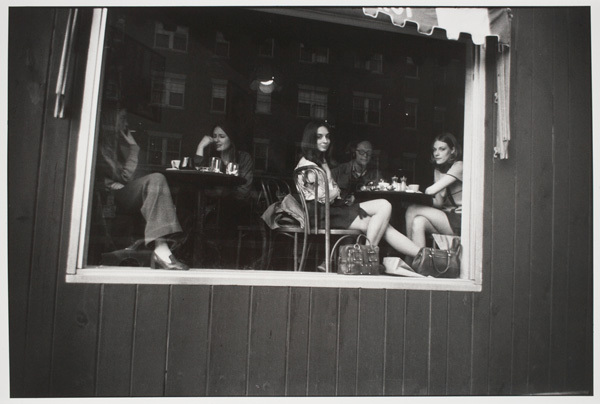 The women at the table on the right are absorbed in their own space, apparently unaware of Winogrand’s presence outside the window. However, the women and man seated at the right, directly address the artist, all with varying degrees of nonchalance. Most important perhaps is the presence of Winogrand himself. 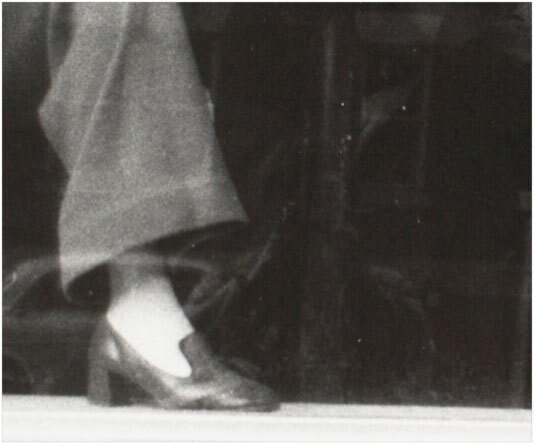 The aforementioned boxy heel securing the image also rests aside a ghostly reflection of the photographer (detail below). In his article “Class Time with Garry Winogrand,” O.C. Garza, a former student of Winogrand’s at the University of Texas at Austin, described Winogrand’s drive-by shooting technique as “a predator looking for his next meal”. He would wrap the leather strap of his Leica M4 around his arm and with balletic grace loop the camera to his eye then shoot, already looking for the next shot. Still, Winogrand insisted he always used his viewfinder if only for a microsecond. His framing, while often askance, was never haphazard.